◾When a new position is needed or created. ◾When past selection practices did not meet expectations. ◾When position requirements are unsure..
◾When turnover is causing executive team building and productivity failures. ◾When a guarantee of success is vital. We employ a comprehensive, organizational development process to ensure the success not only of your next executive hire – but also of your business. •Create a preliminary profile of the right person for the position, using behavioral and organizational measures along with the more traditional background and experience requirements. •Source, interview and reference-check candidates to ensure they have the required experience and attitude for the position. We ensure the successful integration of the new person into the business. •Hold 30-, 60- and 90-day team reviews to determine if the goals and objectives are being met. •Resolve any issues utilizing team-building, coaching-mentoring and or customized solutions to attain the required results. Committed partners to our clients, we guarantee our client’s satisfaction with the new hire for one year. Getting the right executive for your organization can be the difference between your organization’s growth or stasis. We help you take your organization to the next level. •Reduced financial risk. We are so confident of our ability to help our clients we guarantee our work for one year. •Time-savings. We save you time by getting you the right person for your position. And then we save you more time by ensuring that the new hire is quickly integrated into your organization -- allowing you to reap the benefits faster. •Organizational efficiencies. Our organizational approach to search ensures that your organization will perform efficiently – and more productively -- along with a better communicating executive team. 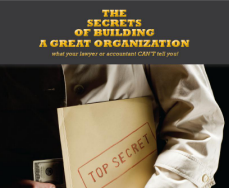 What your lawyer or accountant CAN’T tell you!